ABC comedy A Moody Christmas is set to be remade by CBS TV Studios for the FOX Network, following a bidding war between four networks. Entourage creator Doug Ellin will executive produce along with Jungleboys’ Trent O’Donnell and Phil Lloyd, who will all co-write the US adaptation. Eric and Kim Tannenbaum and Jason Burrows of Jungleboys will also produce, with Trent O’Donnell to direct. This marks yet another ABC series to land a US adaptation following Rake (also on FOX), The Slap, Review with Myles Barlow (also fom Jungleboys) and deals for Laid and The Strange Calls but which are yet to emerge. Please Like Me and Angry Boys have also screened in their original form on US television. FOX also screens the US version of SBS comedy Wilfred. Jungleboys signed with US management, Mosaic, earlier this year. 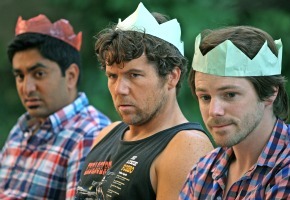 A follow-up to A Moody Christmas, known as The Moodys, is about to begin filming in Sydney. Yes, this show was so well done, we don’t need the US version here. Wish they would just screen the show not remake it. I am looking forward to the second “season” in Oz! Hope the US like their version, just hope no one bothers here!